The Baikal-Amur (BAM) and the Amur-Yakutsk (AYAM) mainlines traverse some of the most isolated small towns in Siberia and the Russian Far East. 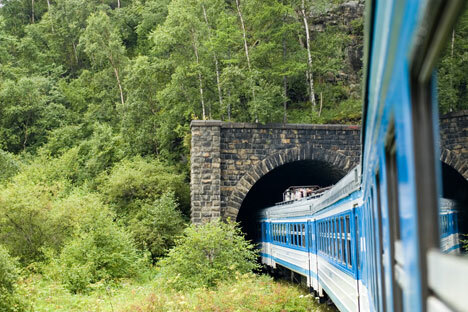 There was a time when the Trans-Siberian Railway was well beyond the reach of most travellers, offering bragging rights to those that took 5 or 6-day long journeys across the Siberian landmass before heading to Beijing via Mongolia or right up to Russia’s Pacific coast in Vladivostok. Nowadays there are enough tour operators that can offer readymade packages on this route, making a journey to Lake Baikal rather common. Those looking for a less cliché but still epic journey through the Siberian hinterland can consider travelling eastwards on the Baikal-Amur Mainline (BAM), a 4324-kilometre journey that connects Tayshet, near Irkustk, to Sovetskaya Gavan, a town on the Pacific Ocean. Like many engineering marvels in the region, Gulag labour was largely used to construct stretches of the railway line first in the 1930s and then the mid-1940s when Japanese and German prisoners of war were forced to build the extensions. A large portion of the BAM crosses a permafrost zone and the natural scenery year round can be breathtaking with the trains running over 4000 bridges. The BAM was expanded during the Brezhnev era, with the long-time Soviet leader calling it the “project of the century.” Around $14 billion is believed to have been spent on the line and several new boomtowns came up around the tracks in the late 1970s. Tynda is one such town that came out of nowhere to serve the railway line and is as Soviet a town as you will find anywhere in the country and is called the unofficial capital of the BAM. The fairly recent Orthodox Church in the town is probably its only non-Soviet structure. Its population, which peaked at 62,000 in the late 1980s has since halved with many residents seeking greener pastures in central Russia. For those interested in the indigenous people of the Russian Far East, there is a small Evenki village, which is close to the city. There has been a revival in attempts to preserve the culture of the original inhabitants of the region, with organisations like the European Bank for Reconstruction and Development supporting such initiatives. Blagoveshchensk, which is 568 kilometres away from Tynda, shares a river border with Heihe in China, a Manchurian boomtown that sits across the Amur. Nowhere are the glaring contrasts between a rising China and a neighbouring Russian Far East on the decline more visible than at this river border. The Russian internal republic of Sakha is also within striking distance of Tynda, with the coal-mining town of Neryungri, just 200-odd kilometres away. Work is underway to connect the line all the way to Yakustsk, a further 800 kilometres. The republic is best known for its abundant supply of diamonds and the Lena Pillars National Park, which is now on the UNESCO World Heritage List. The railway line east from Tynda leads to Komsomolsk-na-Amure, a pretty riverside town with wide broad avenues, well-maintained European architecture and rickety trams. Built to be an industrial powerhouse, Komsomolsk houses a Sukhoi factory, where the SSJ-100 is manufactured. It’s often a good idea to break long-distance train journeys in order to visit some of the cities that are well off the beaten track. Komsomolsk is a city with plenty of culture and is surrounded by nature. After a 1500-kilometre train ride from Tynda, it can be a pleasant place to relax for a few days. Lake Amut, which is in the outskirts of the city is one of the prime ski resorts in the area, but is an equally beautiful place in the warmer months for treks and camping. The terminal station of the BAM is Sovetskaya Gavan (Sovgavan), a port on the Tatar Strait. A nondescript town in terms of activities and architecture, Sovgavan is surrounded by hills that offer panoramic sea views. There are quite a few similarities with the landscape in the summer with the American northwest, which shares the same ocean with the Russian Far East. The raison d’être of Sovgavan is its timber industry, which now supplies nearby China. Although the nearby port of Vanino has acquired prominence after oil and gas companies set up shop in Sakhalin, the effects of the economic boom on the island are not visible in this side of the Tatar Strait. When asked about what else there was to do in the town besides watching an American film in an old single-screen cinema hall or going to a modest museum, a local taxi driver could only suggest a trip to a casino! However, with Russia looking to become a major player in the Asia-Pacific, smaller towns on the Pacific Coast may still have bright prospects. A trip on the BAM and AYAM lines can leave the traveller feeling like some sort of pioneer, exploring some of the most isolated and exotic frontiers of the great Russian landmass. The BAM can be taken from Tayshet. The nearest major airport is Irkutsk (about 5 and a half hour flight from Moscow). If you’re looking to travel westward towards Baikal, Khabarovsk (connected to Japan, China and South Korea) has the closest airport to Sovgavan. Commercial tourism hasn’t been developed in the area to a large extent and the best way to make the most out of a trip is to travel independently.